I fumble for my phone at 05:08 a.m. as it alarms for the second time, and cautiously crack open one eye. I check the shortcut link on my phone's homepage for the Atmospheric Research Science Center summit conditions. Currently the summit of Whiteface is reporting a temperature of 24-degrees Fahrenheit with a wind speed of 7 mph and low intensity; zero excuses not to get out of bed. Because I like to be prepared, I’ve already laid out my gear and filled the kettle on the stove the night before. I make a quick batch of french press coffee and grab some sort of cookie/baked good/granola bar for the drive to Wilmington. I give myself a half hour from the first cold footstep out of bed to stepping out the door. I’ve convinced myself that one of my favorite parts of making the trip is the actual drive itself. I turn up the tunes and enjoy being the only one on the road; a different type of zen. The last few years I have been recreating this morning ritual one to two days a week. This morning it is mostly cloudy and I can’t seem to find the moon. I start out up Boreen wearing only a base layer with a vest on top and a thin soft shell pant. Two years ago I mainly wore a base layer top with a windproof/waterproof jacket and a ski pant. According to NOAA.gov there have been more above freezing days then below so far for the month of January; to me proof of a historical shifting of temperatures. As I near mid station the sky lightens and I turn back to see the silhouette of the Sentinel Range to the southeast. The clouds are hanging low and I continue up under the Facelift. Some days there are snow guns churning out piles of fresh powder — but not today. Today there is good soft coverage, and no wind, making for a much more silent venture. As I skin up, snow cats travel past me on the right. I wave blindly at the drivers behind the glass. The snowcats always reminding me of “The Little Engine That Could”; which I inevitably end up channeling myself. One of the steeper sections comes just before the junction with Little Whiteface, hitting 40% grades. Reaching the top of this always feels rewarding as you can see all the way to VT on a clear day. Today this is where I came out of the clouds. I continue on toward Paron’s Run as the sky began turning brilliant shades of fuchsia. Some days I try to beat my personal best to the summit, and some days I can’t take enough photos. Today I simply stopped and felt the sun hit my skin. The droplets of moisture from the clouds below me felt cool and crisp on my cheeks. I closed my eyes and breathed deep. The air smells clean, almost like spring and the edges of my nostrils are tickled by the cold air. My shirt is damp with sweat and clings to my back; the warm rush of lactic acid pulsing in my legs. There is no real sound, just the occasional squeak of the snow, the staggered planting of ski poles and my own breathing. Reaching the summit on a clear day, with no wind and somewhat warm temperatures is incredible. Reaching the summit on a clear day and being above the clouds is something else entirely, it’s magical. 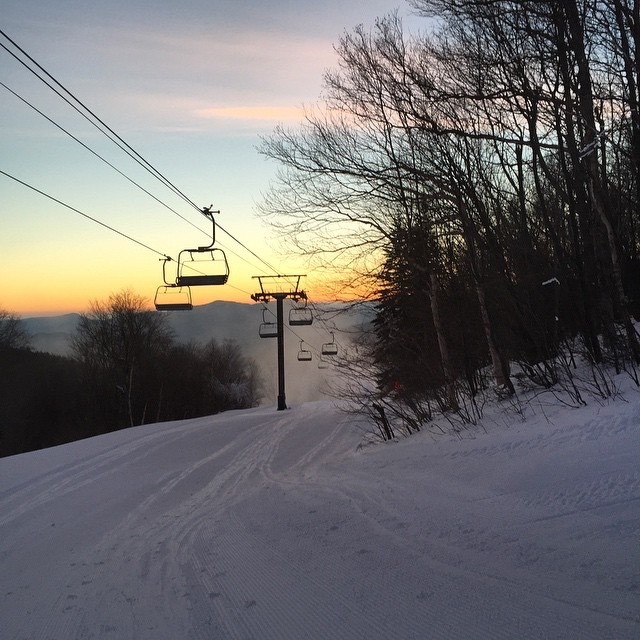 I watched the sun come up and chatted with a fellow skier before going down Skyward. Freshly groomed soft corduroy in the first light of the day is a feeling that I won’t ever get sick of, in fact its addicting. My skimo, short for ski mountaineering, set up weighs less then 10lbs. This includes skis, boots, and bindings. There are numerous ways to get to the top of Whiteface; for me I choose the lightest gear for the best ascent. Alpine touring, or AT gear, is also an option. I started skinning up Whiteface in telemark gear, basically anything that you can free your heel in will work, and of course skins to allow you to travel uphill. A headlamp and preferably a red light on your pack to alert snow cat drivers of your presence. Uphill pass, free for season pass holders and $25 for anyone who wants to just participate in dawn patrol. Get your pass prior to the day you want to skin, no one will be around when you get started. A warm layer for the way down. I always throw on a puffy layer under a shell for the downhill trip. The designated route is up climbers left on Boreen to Mid station, continue up left on Upper Valley to Lower Northway. From here head to the junction to Little Whiteface and then up climbers left of Paron’s Run or the Follies. One of the most important things to look out for is a winch cable. The most likely places you will encounter this is at the top of Skyward or the top of Victoria. In the case you do find this scenario, turn around and either head back the way you came down Paron’s or back toward Excelsior from the top of Victoria. This will require either putting skins back on or hiking it. Don’t ruin this for the rest of us, just do it. It’s not always rainbows and unicorns out there. I’ve turned around more than once. Use your head and follow the guidelines posted here. Most of all, enjoy the journey. Ready to take your ski vacation to a new level - try skinning up the mountain this year! 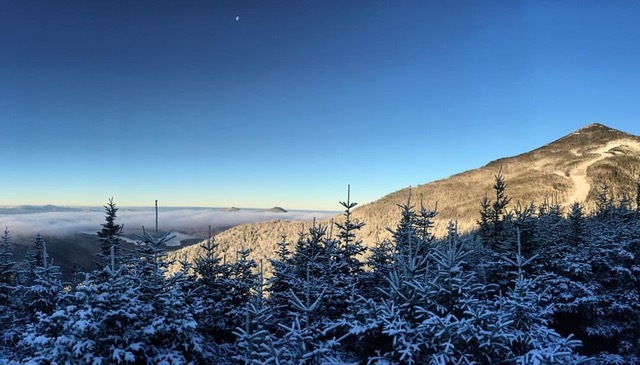 Stay close to the action in the Whiteface Region! We've got comfy lodging options and plenty of good eats and warm drinks to fill you up after your long day on the slopes.